1. Get equipped The equipment you’ll need depends on your type of work and you probably have the basics – computer, printer, scanner, shredder. It is useful to have a smart phone specifically for business which you can set to voicemail after hours. Insider knowledge: Don’t buy expensive equipment to start with. You’ll soon find out what’s essential. 2. Where to put it? 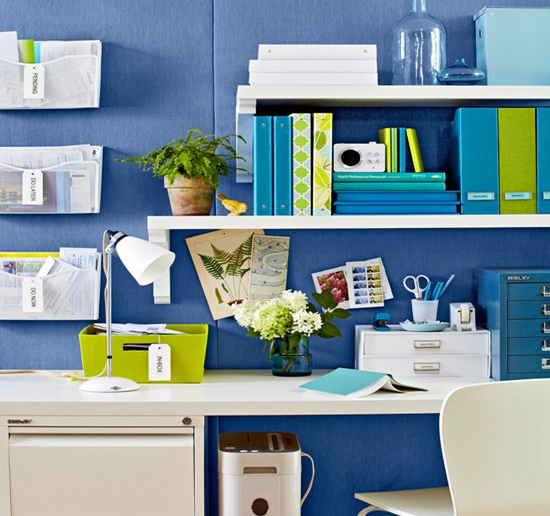 When planning, make a list of all the materials you’ll need to store – books, ink, paper, stationery… It’s easy to underestimate your storage needs and end up with a cluttered and inefficient workspace. Insider knowledge: It’s cheap to source smart boxes and files in co-ordinating colours. 3. Getting together Unless you have a dedicated room for your home office, consider whether you might prefer to meet clients elsewhere, either at their base or in a meeting room rented by the hour in a hotel or large office building. 4. Decorating and finishing touches How your workspace looks affects your mood and motivation so consider colour, texture, comfort and ambience. Have a look online for ideas. Insider knowledge: A notice board for uplifting photos, affirmations, letters of thanks helps with motivation and some people like to burn scented candles or play soothing music to inspire or encourage creativity. Remember, if you will be video calling or conferencing your background should look uncluttered to avoid distracting the caller. 5. A place for everything… Before you decide where you are going to put everything in your workspace, sit in the chair and imagine going through a normal work day. Is everything you need to hand? Is your phone in its charging cradle in front of you? Do you have to open a drawer to find a pen or notepad? Do you have to get up to reach the filing cabinet? Stretch to reach a much-used reference book? Can you see the wall clock without twisting round? Can you reach the switches for computer and peripherals? Then move everything to its optimal position. The trick is to keep the most-used items nearest and the least used items farther away. A tidy office is a tidy mind so having set up your workspace, keep it well organised so you can impress with your efficiency and ability to find information quickly. Finally, sit back and enjoy your workspace and the exciting prospect of working from home. In next week’s blog we’ll reveal how contracting can give you the professional and personal lifestyle you’ve always wanted. Meanwhile, if you have any tips or your own ideas on how to create a workspace to harness maximum productivity, we’d love to hear from you so please leave a comment.